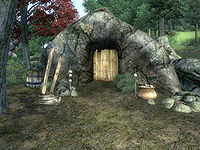 Goblin Jim's Cave is a medium-sized cave north of Skingrad containing goblins. It contains three zones: Goblin Jim's Cave, Goblin Jim's Whiteskin City, and Goblin Jim's Pantry. This cave contains 40 Cairn Bolete plants and 34 Wisp Stalk plants. 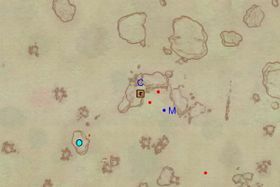 The map marker can be added by talking about "Goblin hunting" with Fadus Calidius in Skingrad Fighters Guild. 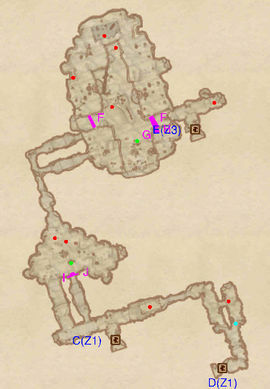 This location's map marker (M on map) is named Goblin Jim's Cave (editor name GoblinJimsCaveMapMarker). The entrance door is NW of the marker, 40 feet away. 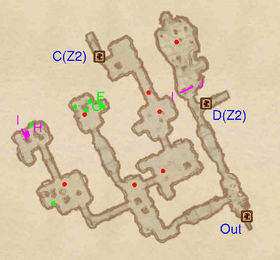 If you are interested in quick exploration, you can reach the next zone very rapidly by heading straight down the tunnel from the entrance to door D. Don't bother with the room at the end of the corridor as it only contains a goblin, although it can be taken out by activating the falling logs trap at J via the tripwire at I. 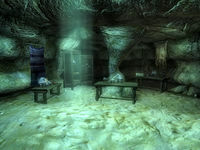 For a more rounded exploration, as well as the possibility of avoiding up to two enemies in the next zone, head left straight after entering. The next room presents a three-way junction. Head left and you will gain access to two minor loot chests; one is guarded by a goblin while the other is protected by a swinging mace trap (H). Pressing straight ahead you will arrive in a well-stocked alchemical room guarded by a goblin. Here you will find four minor loot chests and a variety of alchemical equipment: one Novice Calcinator, one Novice Mortar & Pestle, three Novice Alembics and five Novice Retorts (at F and G). On a shelf you will also find the Blunt skill book Night Falls on Sentinel and a copy of Darkest Darkness. 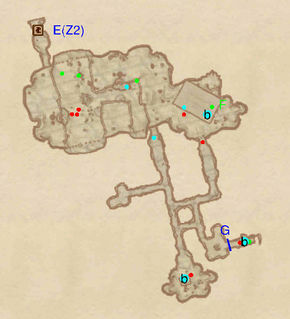 When you're done, head right at the junction and battle past three goblins to reach door C.
Upon entering, head straight to the left and then take the second tunnel on the right. 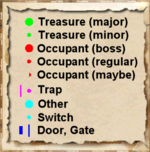 They both lead to the same room but this way you avoid the swinging mace trap at I. The room contains two goblins, a minor loot chest and a bottle of cheap wine. Press on and take the first tunnel on the right as this leads to the higher level of the next room; from here you can snipe at the lone goblin below. Provided the tribal totem staff is in the cave then three more goblins are present: two in the upper level and one on the lower level. The ones on the higher level can be dispatched by clever use of the two rotten plank traps at F and the swinging log trap at G. Also on the higher level is a rather odd ruin: half of a room from a home sits in the northern section. 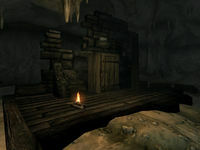 The lower level instead holds a minor loot chest and a small cage containing a skeleton. In the following corridor a single goblin guards the door (E) to the next zone. On a nearby table is an iron dagger. Upon entering from door E you will be on the lower level of a large room in the company of three rats and two minor loot chests. Tread carefully as you may be detected by Goblin Jim himself from the higher level. Follow the long corridor and take the second left and then the first right: this leads you to a very odd room where behind the locked wooden door G is a tiny alcove where a goblin has made his camp with a bedroll (b) and chest. 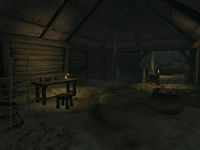 Head north and you will arrive in the upper level of the first room. Here two goblins are guarding Goblin Jim's living area which consists of a thatched-roofed open-walled house with a bed (b), a food dump (F) and a dining table. On the table is a dead rat which is roughly one quarter the size of a normal rat alongside a single gold coin. A copy of A Children's Anuad is at the foot of the bed. Jim himself is slightly further to the north-west.